At 3:30 am, on Friday, November 2, 2018, our plane touched down at the Ben Gurion airport, Tel Aviv. We marched out of the arrival hall, straight into the white, luxurious bus of Tailor Made Tour, to a warm reception by Sima Even, a lovely woman on the verge of 60 years. It was heartwarming to find that the agile, lively and friendly guide knew quite a bit about Nigeria. She spoke some Yoruba and was conversant with Nigerian gospel songs. She was a delightful preface to our visit to Israel. A group of 15 pilgrims from Rose of Sharon Glorious Ministry International, including The Sun reporter, had embarked on this journey sponsored by philanthropist Folorunso Alakija. It was the third phase of pilgrimage to the Holy Land bankrolled by the leader of the ministry. Additional pilgrims raised the number to 36. And for the nine days, we combed the cities and countryside of modern Israel for biblical sites. In Baytin (Bethel) we saw where Jacob slept and dreamt of angels descending and ascending. We saw the statue of Abraham in the act of sacrificing his son Isaac. â€œOn this bridge, whatever you wish comes to fruition,â€ our guide informed as we walked on it. We saw different zodiac signs. â€œAll you need do is trace your sign and pray there,â€ she said. We travelled northward to Haifa, to Mount Carmel, the place where Elijah called down fire that consumed 850 prophets of Baal. On the mount, we had prayer sessions, conducted by four ordained men of God amongst us. From there, we drove eastward to Tiberias. Mrs Adeola Adekola, CEO, Ideals Pilgrimage Limited, whose agency handled the tour, checked us in into King Solomon Tiberias Hotel. The rest of the day wound up slowly: rest, dinner, fellowship and bed. Our wake up call was 5:30 am and Day Two began with fellowship and breakfast. By 8 am, we were on the move. The day was Saturday, the Sabbath, Jewish religious day. The road was free as we travelled to Nazareth Village, a replica of the ancient biblical community of Nazareth where livestock is reared, and crops are grown, harvested and processed in workshops. The sights included olive press mill, weaverâ€™s loom, the carpentry tools of Joseph, shepherds and their herd, men and women garbed in robes and camel sandals in the fashion of the days of Jesus. Lunch in Nazareth Villageâ€“â€“ typical first-century mealâ€“â€“evoked visions from the bible. It was interesting seeing the real-life perspective of events recorded in the scripture. Other places we visited included Cana of Galilee, the city where Jesus performed his first miracle by turning water into wine at a wedding. There, four members of our team renewed their marital vows. From a nearby shop, we bought the Cana of Galilee wine, mustard seed, olive oil and other souvenirs. We sailed on the Sea of Galilee. We sailed. We prayed. We dance on a wooden boat that since time immemorial was referred to as â€œthe Jesus boatâ€ upon which was hoisted the Nigeria flag. The DJ played popular Nigerian gospel songs. We found to our amazement Israelis speaking smatterings of Yoruba. Ekaa boo. Sâ€™alafia ni? River Jordan was not left out of our itinerary. Before leaving Nigeria, I had a mind to re-baptize thereâ€“â€“and even vowed â€˜that water must touch all parts of my body.â€™ When I saw the opaque brown water of River Jordan, I felt exhilarated. I was baptized alongside other pilgrims in the river where Jesus Christ was baptized. We visited Ein Karem, the birthplace of John the Baptist. Included in our itinerary was a trip to the Dead Sea, where people immersed themselves in the salty, black water reputedly potent in healing all sorts of skin diseases. People bathed in the muddy water, rubbing their bodies with mineral-rich black sludge. We had seen shops in Bethlehem and Jerusalem selling refined Dead Sea mud products reportedly good for spa treatments. Though we arrived in its vicinity from Tel Jericho by cable car, we decidedly climbed our way to the summit of Mount of Temptation where Jesus fasted for 40 days. Climbing the 110 steps was enervating. After the 50th step, I was out of breath and had to rest before continuing the ascent. It was from the top of this mountain that Satan showed Jesus all the glory of the world cajoling that â€œall this I will give you if you will bow down and worship me.â€ The view from the peak was breath- taking, a picturesque panorama that is a seamless tapestry of the Jordan Valley, the Dead Sea and the surrounding countryside. We visited the Nativity Church in Bethlehem where Jesus was born. Inside the grotto was the manger, Christâ€™s birthplace and to the right, an altar dedicated to the three wise men that came to worship the newborn. Getting inside the grotto was not easy. The queue was long as pilgrims took a turn to go in and say a brief prayer. For the first time since our arrival, we ate Nigerian foodâ€“â€“potato poundo, ogbono and afang soup prepared by Jewish cooks. Everyone was excited. Other places we visited in Bethlehem was the Shepherdsâ€™ Field where angels announced Christâ€™s birth to the shepherds and the place where Ruth met Boaz. In Jerusalem, we walked in the footsteps of Jesusâ€“â€“the temple he visited severally; the Garden of Destiny where he prayed the night he was arrested; the House of Caiaphas, where he was first tried and spent the night in the dungeon; the streets he passed through bearing his cross to Golgotha. You couldnâ€™t claim to have been to Jerusalem without visiting the Wailing Wall to pray and carefully tuck your written prayer request in the crevices on the wall. 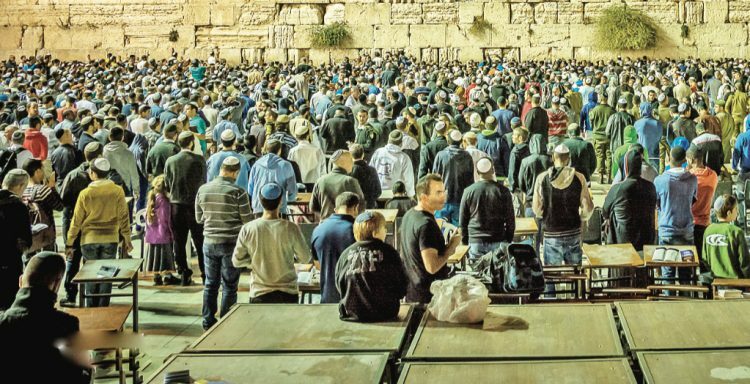 Tourists, pilgrims and people from all over the world trooped in to pray and touch the magnificent Western Wall. Our amiable tour guide Sima, also took us to Time Elevator Jerusalem, a â€œvirtual reality multimedia extravaganza with moving chairs which takes the audience through the turbulent history of Israel.â€ Surrounded by giant screens and motion-based seats, viewers experience the sensation of viewing the movie as a participant rather than a spectator. We viewed Jerusalemâ€™s most dramatic moment, a journey into the hidden secrets of Jerusalem and an exciting journey to the wonders of the past, the present and the future of Israelâ€™s capital. Our journey between Jericho and Jerusalem was a half hour bus ride. We saw plenty of olives, grapes and lemon trees. The most exciting sight was the sycamore tree that Zacchaeus climbed to catch a glimpse of Jesus. Our driver, Issa Alloun from Jerusalem, drove through the deserts and we had a good view of hills, mountains, and valleys, a sight that leaves one in wonderment of God. It was strictly a spiritual expedition for members of Rose of Sharon Ministry. As a first-time visitor, the beauty of Jerusalemâ€“â€“architecture, road network and the serenity of the cityâ€“â€“wowed me. We spent four nights in King Solomon Hotel of Tiberias, three nights in Bethlehemâ€™s Golden Park Hotel and two nights at Jerusalem Gate Hotel. I opened the balcony door of my chalet to the stunning vista of the Sea of Galilee and I asked myself: â€˜Is this for real, waking up to a view the biblical Sea of Galilee? I wanted to know if the experience is the same for all pilgrims to the Holy Land. Our guide from Nigeria, Adekola, said there are different packages. â€œRose of Sharon paid for this wonderful package,â€ she affirmed. I took my next questions to one of the ministers on the trip, Pastor Amos Olu Oladele of People of Testimony Christian Center, Ibadan. I wanted to know if pilgrimage to Israel is an obligation for Christians.